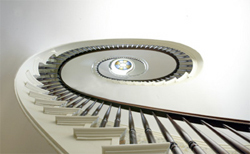 A beautiful, African mahogany spiral staircase goes up four stories from the main entrance to the widow's walk. The E. T. Wilson funeral business was started in 1842 by Benjamin G. Wilson, the great, great, grandfather of todays' owner, Stephen Woodacre. The funeral home moved from it's original location, where City Hall stands today, "up the hill" to a very famous old New Bedford whaling captain's home in 1938. Captain Stephen N. Potter sailed the world in search of whales; he brought home many of the existing momentos still visable in the Wilson Chapel today. The main areas of the home still consist of most of the original materials used to build the house in 1839. Today funeral directors Stephen Woodacre and Bill Reed offer a wide variety of funeral service offerings. The Wilson Chapel is committed to satisfying your needs with the finest funeral service available. It is interesting to note in the Wilson files the cost of a casket and service in 1853, which included a small pine box, ran $15.50. Just five years later, the cost of the same package was anywhere from $18.00 to $30.50, with an outside box costing $1.25. 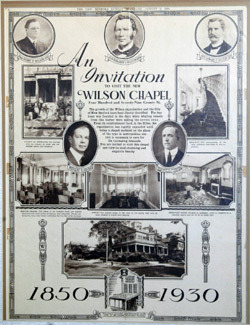 Stephen Woodacre estimates that the firm has conducted over 27,000 funerals in the Wilson Chapel since the firm was founded. However, it wasn't until 1952 that they were allowed to put a small sign on the exterior of the home indicating it was a funeral chapel. The Wilson Chapel represents one of America's oldest and most beautiful settings for a funeral service. Thank you for visiting our site! Please feel free to contact us with any questions you may have regarding our funeral services.